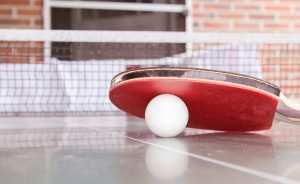 As a coach and player of many years, there are certain common errors that I see repeated many times by players new to the sport of ping-pong. On the basis that an ounce of prevention is worth a pound of cure, I’ve put together my list of the 10 most common mistakes made by new table tennis players. Read on and make sure that you are not falling victim to these ping-pong pitfalls. Gripping the paddle incorrectly is one of the most common mistakes made by beginners. A poor grip can hinder your ability to play certain strokes, use your wrist properly, and ultimately limit your playing standard. I’d recommend starting and sticking with one of the conventional ping-pong grips. Another mistake made by table tennis newbies is trying to guide the ball over the net and onto the table, instead of stroking the ball. This tends to happen when new players first begin to compete. They get worried about making mistakes, and try to steer the ball, instead of hitting the ball just like they do in practice. When you try to guide the ball, you are not giving yourself the best chance to make a good return. Just relax and hit it! The flip side of guiding the ball is when new players try to whack the ball way too hard. The result is the same though – you’ll make lots of mistakes! Remember that for each stroke, there is a maximum amount of speed that you can use, or else the ball won’t land on the other side of the table. Just like Goldilocks, don’t hit too hard, or too soft, but just right. Some new players seem to hate moving their feet – so they stretch and lean all over the place, when a small step in the right direction would allow them to play their best stroke more often. Then, when the ball is out of reach, these players finally move their feet, but often move too far, ending up way too close to the ball and cramping their stroke. So don’t be afraid to move your feet – but the idea is to move towards or away from the ball, so you can hit it at your best range. Time and time again I see players come to the clubs at which I play, with bad habits they have developed while playing at home. Then these players have to spend many hours getting rid of these bad habits in order to improve. Take it from me – even if you are only planning to play for fun at home, a lesson or two for the family from a table tennis coach will help you learn the basic strokes, and can save you a lot of time later on if you decide to get serious. Ping-pong players are a pretty friendly lot, so you can guarantee that if you are a new player, you’ll get plenty of advice from your fellow enthusiasts. But remember to use your own common sense as well when listening to advice – not every nugget of wisdom you hear will suit the way you play. And you’ll get conflicting advice fairly often too! So remember to listen to the tip, think about what you have been told, and if you don’t think it makes sense for you, feel free to ignore it. If it’s necessary take some lesson with a coach. After using a cheap pre-made bat to begin with, many beginners then go to a club, and see what advanced players can do to a table tennis ball with their custom made rackets. Then the newbies go out and buy the fastest, most expensive paddle they can get, and find that they can’t use it! Before buying your first serious paddle, get some advice from a coach or experienced player as to what sort of bat you should start with – an all-round blade with classic rubbers should do the trick. Many new players, just introduced to the world of custom made paddles, suddenly treat it like the dating game – they try many new rubbers and blades, mixing and matching like there is no tomorrow. Don’t do this – once you have got your first serious paddle (after getting some good advice on what to buy), stick with it for at least 4-6 months before looking for something new. By that time, you’ll probably just need some newer versions of your rubbers, and you’ll be good for another 4-6 months. At home, you can play any rules you like – bouncing the ball off the pot plants and onto the table can count for double points if you want! But once you go to the clubs and competitions, make sure you are familiar with the official rules of ping-pong/ table tennis, so that you avoid any nasty surprises when your killer serve is called a fault by the umpire, because your opponent can’t see it! Table tennis is a game that is very easy to play but incredibly difficult to master. Many new players expect to play like experts after just a year or two. Trust me on this – it is not going to happen to you! Ping-pong is a very complex sport, requiring concentration, fitness, skill and perseverance. On the plus side, you can still be playing table tennis well into your eighties – so relax, enjoy the sport, and the improvement will come. Time is on your side – trust me!